For the longest time, I didn’t like shrimp. I know, weird. Something about it was just gross to me. Probably because I couldn’t stomach peel and eat shrimp with cocktail sauce. I despise cocktail sauce. And I still despise peel and eat shrimp. But any other kind of shrimp, I can get down with these days. 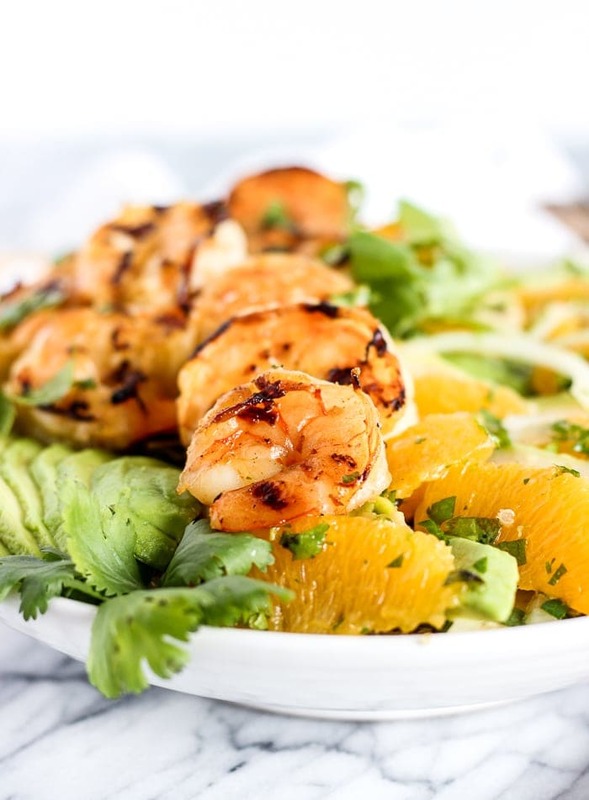 I especially like them grilled, like in this delicious shrimp, orange and avocado quinoa salad! This delicious citrusy quinoa salad is a lovely transition from hearty winter meals to lighter springtime meals. It’s a great way to use your remaining winter oranges in a way that’s bright and flavorful, perfect for warmer spring days. 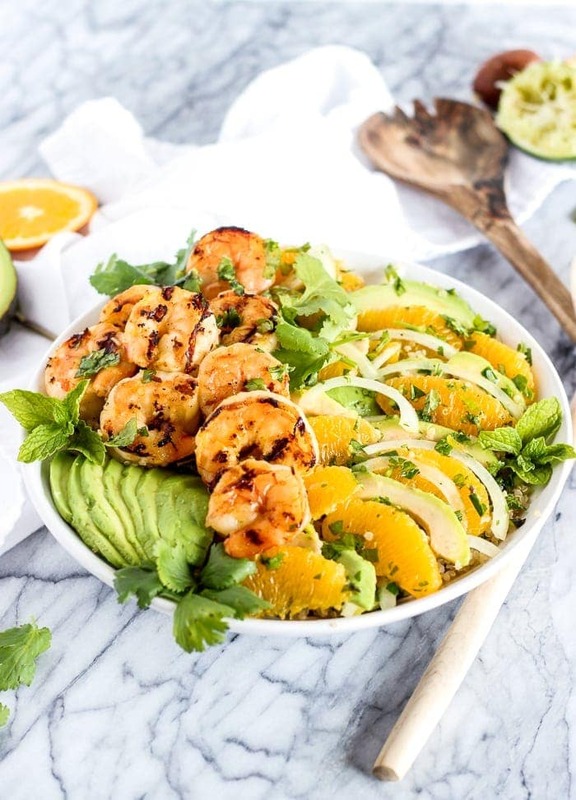 You’ll want to make this shrimp, orange, and avocado quinoa salad well into spring and summer. It’s bursting with citrusy, herby freshness, with just a hint of spice from the shrimp and onion. Balanced with creamy avocado and nutty quinoa, it’s a light meal that is also filling and satisfying. It’s delicious served right after cooking, or just as good served chilled for an easy make-ahead option. 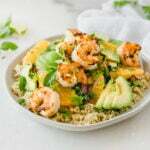 My mom shared this shrimp, orange and avocado quinoa salad recipe with me a couple of years ago, and I just got around to making it. She said it was one of my little brother’s favorites, so I thought I’d give it a try to make for him now that he’s in college where Mr. Table and I live. A little piece of home for him, and a good way to get a healthy meal into him for change! This salad has all the components of a balanced, filling meal. Whole grains, healthy fat, protein and fiber with plenty of vitamins. It’s satisfying, nutritious, and most importantly, delicious! IT’s great for meal-prepping as a healthy lunch or dinner for the week. (just make sure to add the avocado just before serving to avoid brown mush in your salad). I like to serve it chilled over a bed of baby spinach for lunch with a bit of my citrus shallot dressing. So fresh! 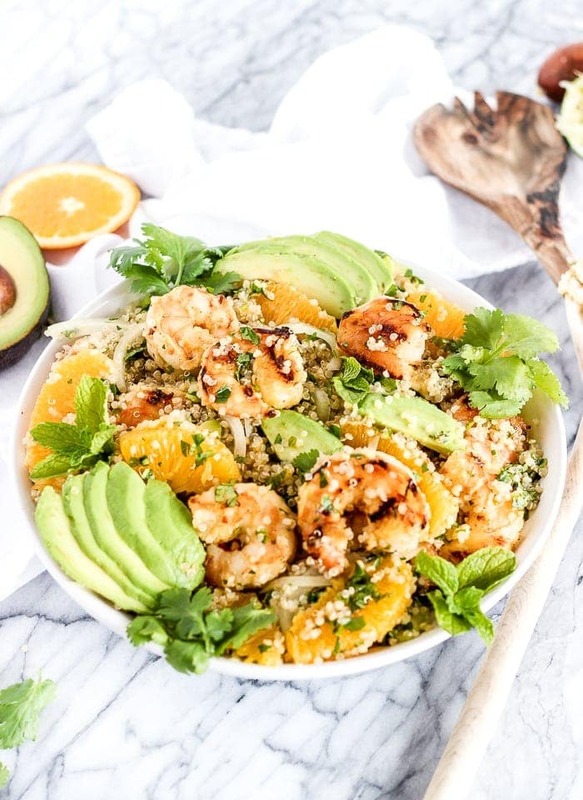 Make this shrimp, orange and avocado quinoa salad even easier by using leftover cooked quinoa, and you’ve got a healthy, delicious meal in no time! In a small saucepan, bring quinoa and broth to a gentle boil. Cover and simmer 15 minutes, or until quinoa has absorbed all of the liquid. Remove from heat. Meanwhile, segment oranges by cutting away outside peel and membranes, then working around the orange, separating the segments from the membranes. Set orange segments aside. Squeeze juice from orange membranes into a large bowl. Add 1 tbsp of the olive oil, garlic, red pepper flakes, salt and pepper. Whisk to combine. Stir in peeled shrimp. 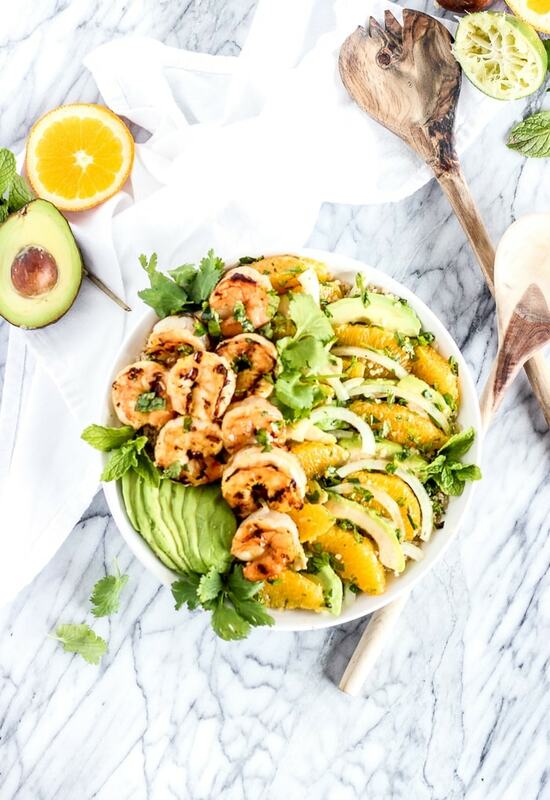 In another large bowl, combine oranges, lime juice, remaining 2 tbsp olive oil, onions, mint, parsley, cilantro and avocado. Gently stir to combine. Set aside. Heat a grill, grill pan, or nonstick skillet over medium heat. Spray with oil spray and cook shrimp 2-3 minutes per side, or until cooked through. Remove from heat. Add shrimp and quinoa to orange mixture. Gently stir to combine and serve. If you will be waiting to serve, refrigerate and add the avocados just before serving. This looks so fresh and healthy! Perfect for spring. I will try this recipe, I love shrimp salad. Thanks G! It’s Landon’s favorite!